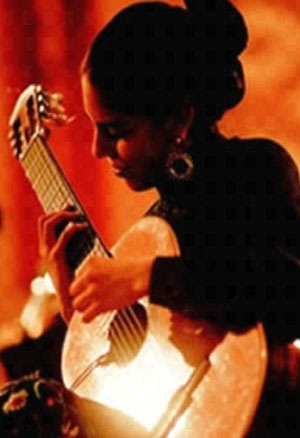 Tuesday, September 21, 2010 12:30 p.m.
As a classical and flamenco guitarist, Anna Maria’s style speaks of her proud heritage as an 18th-generation Santa Fean, a link to the world’s best-preserved enclave of Spanish Colonial culture. Anna Maria’s lecture/performance, includes information on the fleeing of Inquisitional Spain in order to more safely maintain a unique ethnic/religious identity (cases of Crypto-Judaism and Crypto-Islam, the plight of gypsies, or the suppression of Mozarab Catholic expression), the new cultural developments encountered in an emerging Mexico and the trials and triumph of Spanish Colonial identity in the most dangerous and remote outpost of the Spanish New World -- looking specifically at the contributions of the Penitente cult, the great maintainer of Spanish religiosity and culture through centuries of isolation and a hidden clue to the origins of Hispanic identity throughout the world today. She has won world-wide acclaim for both her guitar and singing performances, has many CDs to her credit and has provided vocals for the latest album featuring Kanye West and John Legend titled Good Morning Good Night. Anna Maria received the Joint Service Civilian Commendation Medal and the Secretary of Defense Medal for her service in the Global War on Terrorism, and was a laureate of the Mother Theresa Award for her artistic efforts.